Gender Defenders are courageous community volunteers, trained by ActionAid, who stand up to sexual and gender-based violence in Kenya. It's a name they came up with themselves, and one they bear with pride. From helping survivors reach hospital to navigating the legal system, each one – women and men – plays a vital role in preventing and responding to violence. Some are mums whose daughters have been raped. Others have personal experiences, like Alice, whose story I'd like to share with you. For our Christmas appeal this year we are asking for your support to transform lives by sponsoring a child. In conflict-hit countries, millions of girls are living in fear. Child sponsorship helps us provide psychosocial services, family centres, school supplies and more, to help traumatised children rebuild their futures. Actress Miriam Margolyes has supported ActionAid for over 30 years. She visited our work in the occupied Palestinian territory and has seen first-hand the impact child sponsorship makes. She tells us what it means to be a child sponsor with ActionAid. What do teenage girls think about violence against women? 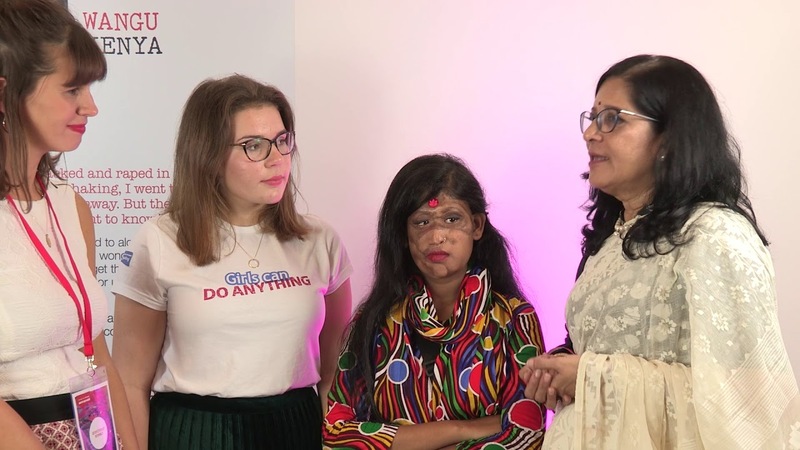 Last night, 16-year-old Girlguide, Caitlin, met 16-year-old acid attack survivor Shonali, after ActionAid's Survivors' Runway fashion show. This special event was to stand in solidarity with survivors to end all forms of violence against women and girls. Watch the two teenagers reflect on the show and share their messages to girls in the UK for International Day of the Girl.